Here's the solution to the mystery in my previous post. The object you see below is a quiet carriage return wire from my purple Torpedo. It was too loose, so it wasn't working; I took it out to inspect it before squeezing it a bit tighter so it would work again. The principle is simple: the wire is looped around the escapement wheel; when you return the carriage, the rotation of the wheel (counterclockwise in this photo) pushes the straight arm of the wire against the dog (a tooth that engages the teeth of the wheel when you're typing). This gets the dog out of the way so that the wheel's teeth don't hit it. I don't know when the first machine with a quiet carriage return was introduced, but in the '50s this became a frequent feature on typewriters of all sizes. With me it has become a bit of a fixation. Not only does this feature make the return quieter and smoother, but it simply seems mechanically more correct: you're not wearing down the escapement or doing unnecessary work. Usually the sound of a typewriter that lacks this feature is a not-unpleasant "zzzzzip." In fact, many typists really enjoy the canonical end-of-line sounds: click clack click clack DING zzzzzzip. But Smith-Corona portables tend to make a nasty, rasping noise when you return the carriage. It adds a jarringly unrefined element to these generally sophisticated typewriters. I've often wished I could fix it, and after studying the Torpedo wire I decided to try adapting the principle to a Smith-Corona. I set to work with some spring wire, wire cutters, and needlenose pliers. My first prototypes were too simple. They didn't grip the escapement wheel enough, or they were liable to be knocked out of place when the typewriter was operating. So I gradually developed a more complicated shape to account for these problems. Here's my successful design. Meet the Polt Silencer™. Here's what it looks like when installed. (It's designed for midsized Smith-Corona portables made from 1950 on, AKA the Super 5 line and later.) Getting it in is a bit tricky, because you have to slip it under the tabulator brake (a circular device with various springs which is attached to the escapement wheel). It works just like the device on the Torpedo: when you return the carriage, the escapement wheel turns counterclockwise and the Silencer pushes the dog out of the way, avoiding That Nasty Sound. Does it make a difference? Judge for yourself. It's in the nature of the Smith-Corona design that it still offers more resistance and sound than extremely smooth machines such as Olympias, but the Silencer creates a definite improvement. It leaves me wondering why the company didn't add such a feature. In any case, I feel a great satisfaction in having actually invented a helpful typewriter part. Will the Polt Silencer ever be available to the eager masses of Smith-Corona users? Possibly. 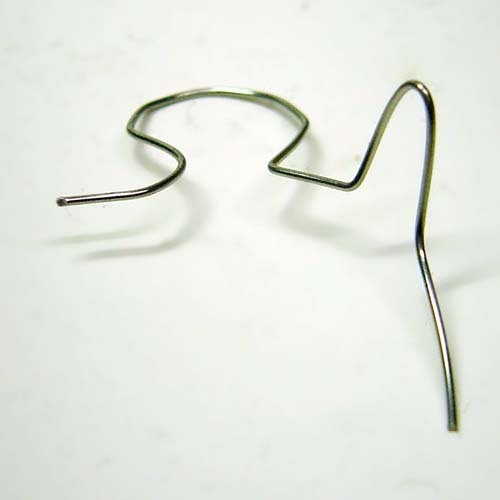 There are wonderful machines that can be programmed to make custom wire forms. It would be so much fun to watch them produce my design! A quiz for you: What are these typewriter parts? The first photo shows a factory-made part. The next photo shows the first three prototypes I created, inspired by the factory part. The last photo shows my fourth attempt, which works as intended. Guess away in the comments, and the truth will be revealed in due course. PS to question 15: Actually, ETCA and IFHB aren't "local" but international. Click here for my original post on the Jaykay. Followup: The typewriter's Indian origin has been confirmed! Read about it here. Frans van de Rivière has pointed out to me that there was another Indian typewriter manufacturer: FAL (Facit Asia Limited). The highest known Brosette serial number is 46160. Despite the appearance of my typewritten product, I have used a typewriter before, albeit an electric one of my parents. I had alignment troubles on the electric, but not nearly as bad as with these two typewriters (Royal and Webster). I don’t how or why this happened, as I am not familiar with the mechanics of the typewriter. However, I think I exemplify my preference of handwriting to the medium of the typewriter because the form of my typewritten document is contrary to its function. What I am getting harkens back to Kittler and his notion of human beings being unable to control the media and media influencing and determining our understanding of the world as well as our consciousness of it. The innovation of a typewriter as a machine implies its capability of inner motion and something we don’t fully understand because it is autonomous and doesn’t necessarily require human beings to act upon it in order for it to act. This is shown in my typewritten summary when the lines run together and overlap. The typewriter was invented to standardize handwriting in order to avoid misinterpretation in the workplace. This in turn suppressed individuality, or the tendency for idiosyncrasies of each person to come out when the word was written. Individuality or personality is an external manifestation of how one’s mind works. With the typewriter, there is an element of depersonalization as well as a proposed paradigm of thinking that I don’t believe accurately reflects how the brain works. All the aspects of handwriting (e.g. how close the lines/words/letters are together, how the different letters are made, scratch outs, etc.) say something about the thought process of the person doing the handwriting. The birth of the typewriter and its intended purpose has influenced people to deem the running together of lines written by the typewriter to be a mistake and start over on a new page as it is more open to a misreading. In this way, I believe that the typewriter is overall less true to the inner workings human brain than handwriting. I think the lines blurring together is symbolic of how the brain makes associations and moves from thought to thought. This is why I kept the way it is. Despite my somewhat frustrating experience, I think that my non-conventional use of the typewriter is even more reflective of brain mechanics, unlike a conventional acceptance and experience of one.